"At approximately 12:34 p .m. officers with the Winston-Salem Police Department responded to the SunTrust Bank located at 101 S. Stratford Road on a reported robbery. Moments earlier, the suspect entered the bank and informed a teller that he was committing a robbery. The suspect demanded money from the teller and then fled the business with an undisclosed amount of currency. No employees or patrons of the bank were injured during this incident. The robbery of the SunTrust Bank is being investigated by detectives with the Winston-Salem Police Department’s Criminal Investigations Division. 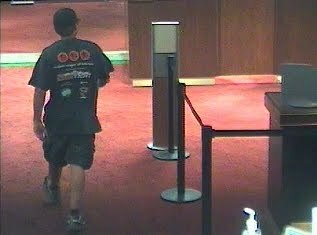 The suspect is described as a white male, 5’06” to 5”08” in height, wearing dark gray shorts, a dark colored ball cap with “CASE” written on the front, a blue shirt with multicolored logos on the front and back of the shirt, tennis shoes and sunglasses. 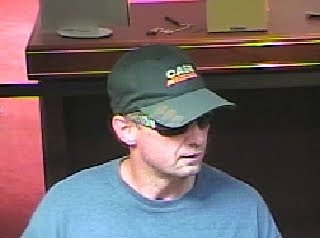 Images depicting the suspect were obtained from bank surveillance footage and are attached to this Public Record Release. Anyone with information regarding the identity of this suspect is asked to call the Winston-Salem Police Department at 336-773-7700 or CrimeStoppers at 336-727-2800. "